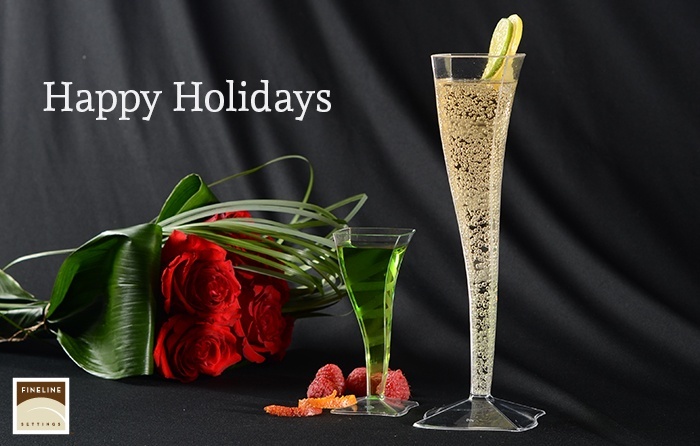 Have A Happier Holiday With A Few Drinks And Fineline Settings! A Belated Happy Thanksgiving to you all, as our Fineline Family & Friends were also happily celebrating our belt-buckle-loosening holiday! We hope your food was comfy, your drinks merry, and the new memories you made with your families this year bright and indellible. Now that we’ve all (hopefully) recovered from our food comas, it’s time for the biggest holiday month of the year! No matter which wonderful holiday you celebrate, we wanted to share a few fun drink recipes we found on Pinterest to help make this season sensational and fun! From belly-warming ciders and cocoas, to sangrias and mixed drink so irresistable that they'll have your loved ones spending the night safe and cozy by the fireplace, we’ve got you covered. We’ve also got some Fineline drinkware that we think would look great paired with these drinks… because we’re always in the holiday spirit of giving! Take a look! The Peppermint Eggnog Milkshake is a cool concoction with a holiday flair that will look fantastic in our new Quenchers Pilsner Glass! Let your loved ones know how much you love them with this sweet treet that looks fabulous! For some pretty thirst-parchers to fill your holiday-ready Renaissance Stemless and Stemware, try the Apple Cinnamon Mimosa and Cranberry Apple Sangria! Both sweet, tangy and spicy, these drinks will be a hit in both style and flavor! Check out this tasty Chocolate Peppermint Milkshake that will have you feeling merry and will look adorable in one of our Flairware ware Margarita or Martini Glasses! Another sweet treat that is perfect for guests of all ages, chocolate and peppermint has never looked so fine! Those are just a few of the delicious drinks we found, and even fewer of the amazingly wide and stylish selection of our drinkware. 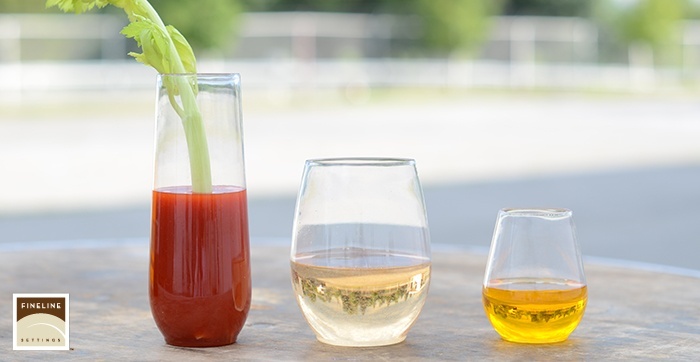 From shotglasses, to Pilsners, Champagne Flutes, Ttumblers, and more, your festivities will be fantastic with Fineline Settings! The holiday season already has us feeling all warm and fuzzy inside, and we can’t wait to share in your family celebrations, and share our top of the line disposables that are pretty enough to decorate a holiday mantle! 2016 Holiday Drink Recipes Pinterest Board! Have a Happy Holiday Season, Friends! Make A Signature Statement That Will Mark Your Holiday Celebrations! As always, it seems as though the holidays creep up on us ever more quickly each year! With Halloween out the door and in-laws practically ringing our doorbells for Thanksgiving, needless to say, this year’s holidays are going to be a bit hectic! Hey, but that’s okay, because just like last year, and the year before that, Fineline is here to help make this season sophisticated and effortless! An elegant and illustrious new addition to your holiday party that embodies old-world grandeur, stunning detail, and modern convenience for your busy life-style! Take a look at just some of the holly jolly highlights of this classically couture collection! Three Perfectly Portioned Sizes for every Holiday Dish! 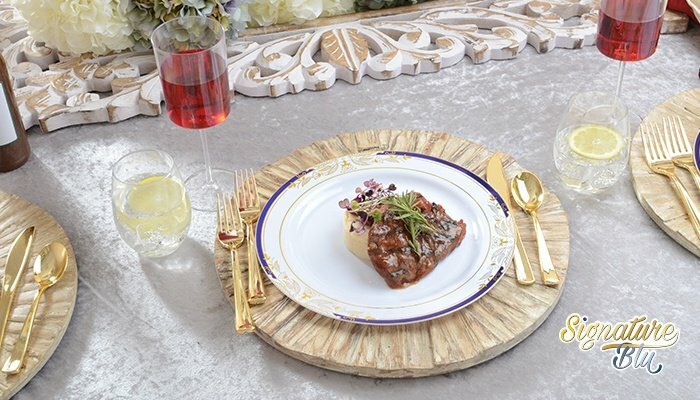 Cobalt and Gold trim heightens an intimate dinner with family; or a holiday bash of 100! 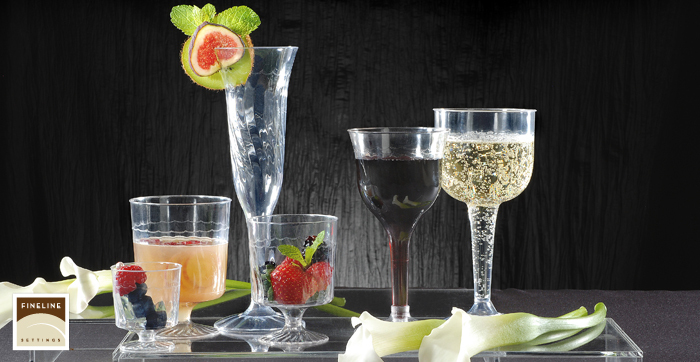 With its Unique Color scheme and design, this collection will match both modern and classic stemware and flatware! Our crisp white base married with foil blue trim and gold stamping creates a signature style reminiscent of fine Victorian dining! Polystyrene durability is disguised with delicate fine details that look prestigious enough for your china cabinet! Fineline is here so that you never have to settle for less, and to assure that your signature standards are never compromised! We hope your holiday season is a spectacular one! -Let The Most Wonderful Time Of The Year Begin!